Friday marked the end of our 4-week intensive Invitational Summer Institute (SI), a leadership program in the teaching of writing that the SDAWP facilitates each summer. We’ve been together as a group throughout that time, worked in small writing response groups, reading response groups, in pairs and triads all in an effort to stretch our thinking and understanding. So as I started thinking about a photo challenge for this week, the idea of groups came up for me. And looking over photos I have taken in the last week, I came up with many that fit the bill. Here’s a group of umbrellas at the beach last week. 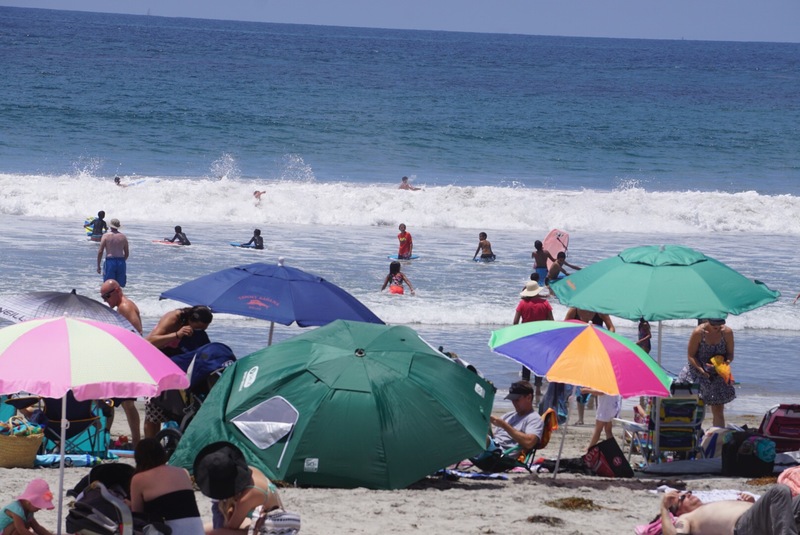 it was bright and sunny and warm, a lovely San Diego beach day…and the umbrellas were out! And who can resist a group of sandpipers? These little brown birds are pretty shy, but are such fun to watch. 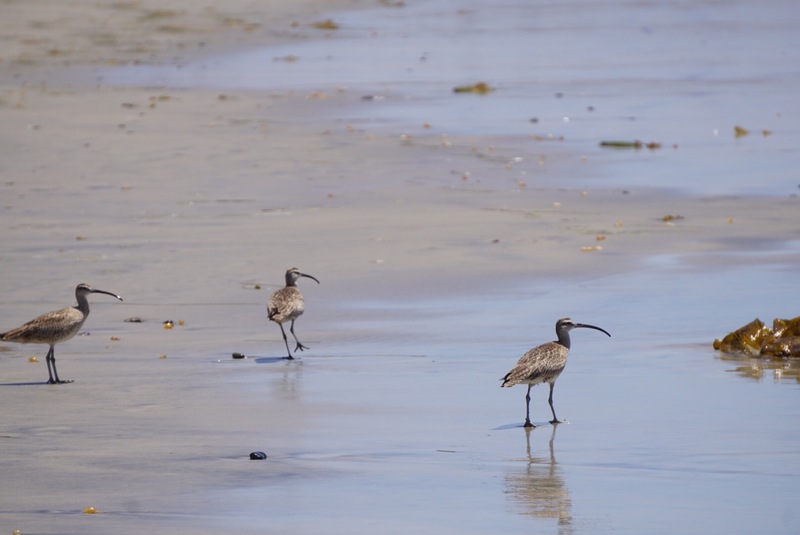 They use their long skinny beaks to poke down into the wet sand for some delicious tidbits. I often see them in pairs, but caught this trio earlier in the week. As I walk down the beach, I pass some iconic landmarks including Stone Steps and Beacons. 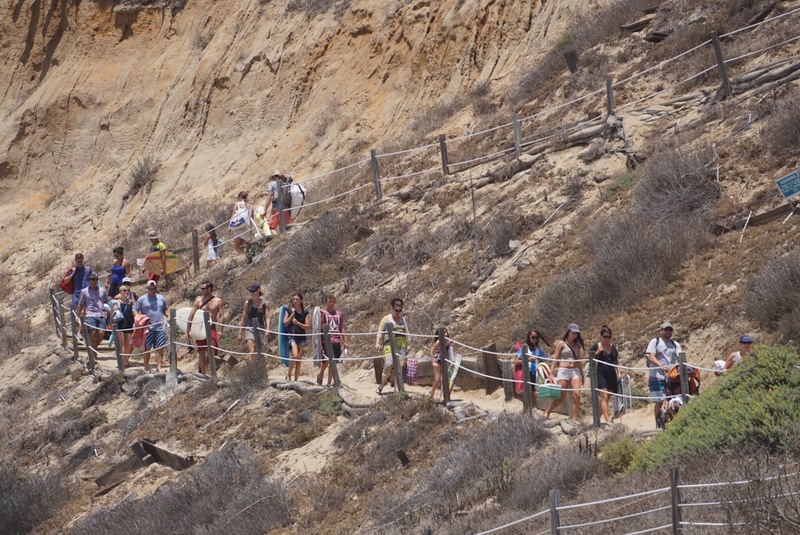 I’m always fascinated by the way that people coming down to the beach look like ants as they switchback from top to bottom. Using my zoom lens, I was able to capture a glimpse of this group. 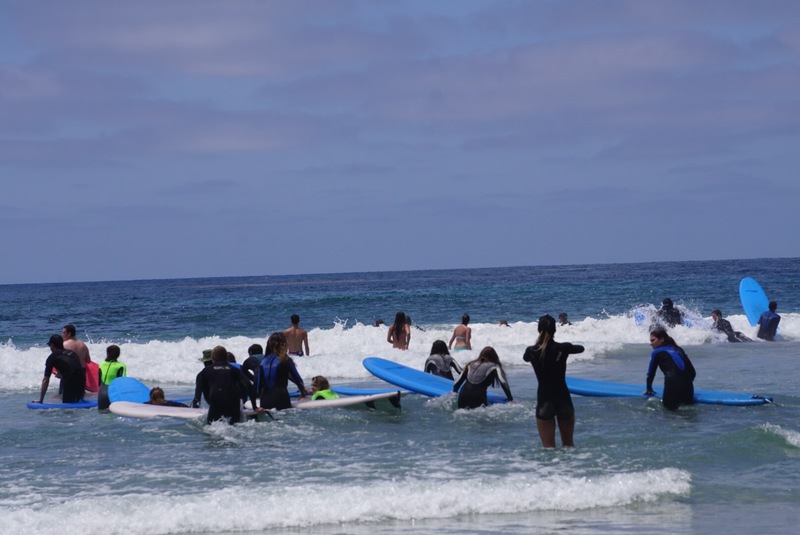 This group of novice surfers appeared to be part of a surf school…and no, they weren’t at Beacons! They seemed to be segregated to a small area, well away from the more experienced surfers. On Thursday, I snuck out of the SI at lunchtime (with many of our participants) and headed up to the top of the engineering building to get a close look at Fallen Star, a unique installation of the Stuart Collection. 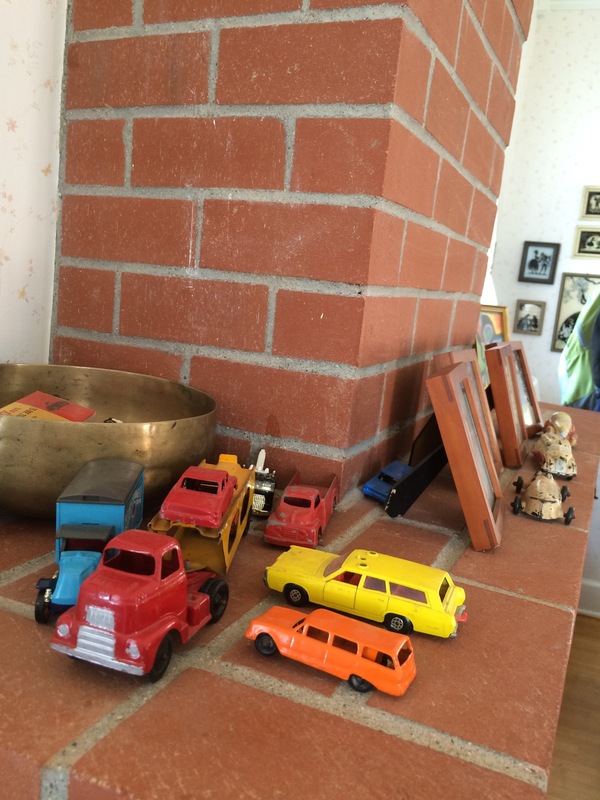 Once inside this tilted house, I noticed this group of toy cars on the fireplace. I had commented to my husband not too long ago that there haven’t been many sand castles on the beach this summer. And then, last night to celebrate the ending of the SI, we decided to take a beach walk after work. And as we walked we noticed this group of castles, a community of sorts near the shore. 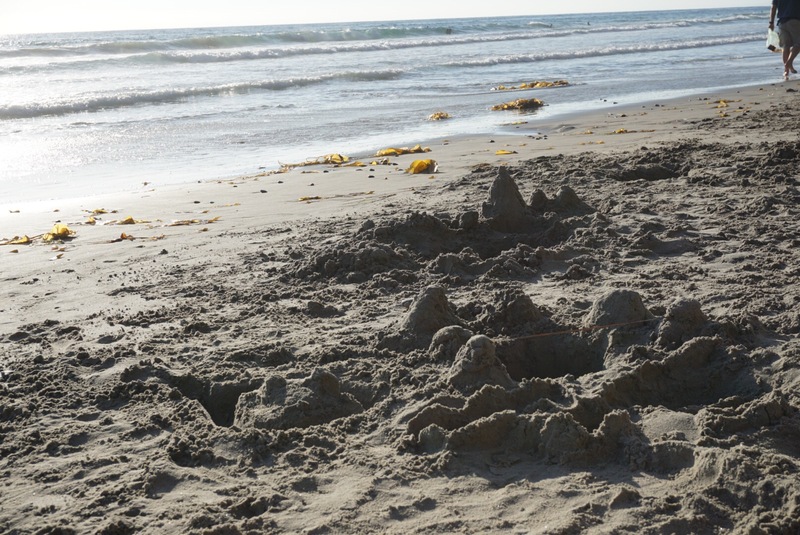 They weren’t too fancy, but I think they count as a group of sandcastles. So, what group have you noticed lately? Groups of people? Animals? Cars? Toys? 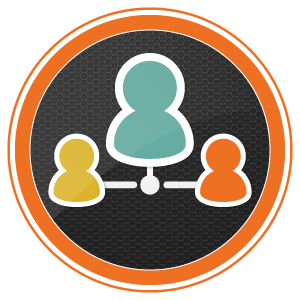 Examine some groups through your lens! I share my photography and writing on social media. You can find me on Instagram and Twitter using @kd0602. If you share your photos and writing on social media too, please let me know so I can follow and see what you are doing. 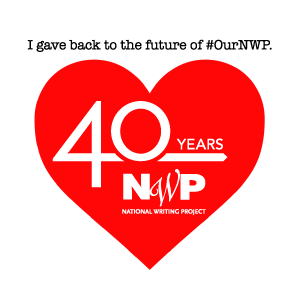 To help our Weekly Photo community find each other, use the hashtag #group for this week and include @nwpianthology in your post. What group will you find as you focus your lens this week? Be sure to share with the rest of us! This entry was posted in clmooc, Weekly Photo Challenge and tagged challenge, group, nwp ianthology, photo essay, photography, writing on July 18, 2015 by kd0602.